This is a slightly longer than usual, rambling somewhat whimsical post. Sorry about that. There is some good stuff toward the end though. Well I think so anyway. Last Thursday I attended the inaugural Mile High Agile conference put on by Agile Denver. The day commenced at an unnaturally early hour with me hurtling down the mountain to Golden and then doing battle with I-70 and I-25. Perhaps due to the early travel time the traffic was lighter than the nightmare I had envisaged and well worth it compared to my regular commute (from bedroom to basement via kitchen) for what I got out of the day. What follows are my thoughts on what I got out of the conference, not all of them directly related to agile. Earlier in the year when I first heard about Mile High Agile I volunteered to help with a couple of items – setting up the website along with another volunteer and the corresponding registration and payment system. It’d been a while since I’d done any kind of web content creation but we elected to make things really simple by just using WordPress with a suitable theme. Although this obviously meant there were quite a number of restrictions (especially since we weren’t hosting the WordPress blog ourselves) it did mean we could get going easily and quickly. Given the chance to do it again I’d almost certainly stick with WordPress considering the simplicity of our needs, but hosting it ourselves would be well worthwhile. That would likely let us get around the problems we faced by using plug-ins which you cannot do when hosting at wordpress.com. For the registration and payment side of things we used EventBrite. This was a service I hadn’t used before (at least not in the role of a conference organizer) and I have to say it’s a pretty impressive offering. While our needs were simple (a handful of ticket types, a few dozen discount codes, simple reporting and so on) EventBrite just seemed to work without effort. Everything we ever wanted to do (bar one thing) seemed to have already been anticipated and worked well. In addition, I had occasion to use their support services twice which are very good and incredibly quick to respond. In the couple months leading up to the conference last week I really enjoyed working with the folks that brought this together. My contribution was pretty small compared to others, but it was fun to be part of it and work with people really intent (passionate is so overused, no?) on making this happen. It was a real joy to see folks pitching in no matter their role offering useful ideas and commentary as things unfolded. I wish I could work with more people like that more often. At the beginning it was unclear how many sponsors we would secure or how many tickets we could hope to sell. Due to a truly outstanding effort on the part of several people we exceeded all expectations. Just check the number of sponsor logos up on the site and note that we sold nearly 500 tickets. Not bad for such an incredibly tight timeframe and the first ever Mile High Agile conference! If you build it they will come. So long as you get the word out and market it hard too. There were a few things that struck after the day of the conference which were nothing to do with agile but interesting insights to me. I’ve been working from home for quite some time. Although I thought I had quite a rich interaction with people on my team via phone, email and IM etc. it was nice to suddenly be in the fray of lots of tech people and talking with them. I was part of the gang that stood behind the registration desk which was insanely busy for an hour or so as the best part of 500 people arrived to check in. It reminded me of a part-time job I had way back in time as a teenager, working in a home computer store on Saturdays which were always insanely busy. I loved it. Definitely makes me hanker for more local, in-person interaction. Another thing that was weird was that driving into Denver didn’t seem too bad. I’ve always found it less than desirable in the past, but after a series of trips into the city over the last year perhaps I’ve finally got a decent sense of how its all connected up in my head and feel more at ease with it. For some reason I’m feeling the urge to visit Denver more and more. The final odd little insight was how nice it was to be surrounded by people who were enthusiastic about various facets of agile software development. Although you might have different views and experiences from others on details, there was this common thread of “getting it” (“it” being agile) and wanting to “get it more.” Perhaps meeting people whose viewpoint reinforces many of your own beliefs is nothing but an ego stroke, but it made me think how cool it would be to work with more people like that. Turning to the sessions I was able to attend three, all of which were in the technical track. I really enjoyed them. I wish there was more – it’d be great if next year were a multi-day conference :-) It also made me think it would have been nice to present. I’m not entirely certain what on, but I feel like I’ve learned a lot over the last couple of years and it’d be fun to share some of that beyond just writing about it on my blog. Maybe next year. The first session I attended was Agile the Pivotal Way given by Mike Gehard of Pivotal Labs. I confess I hadn’t really realized that Pivotal Labs did anything other than make Pivotal Tracker. Turns out that really their business is building software for people, often startups, and they seem to really approach work in a way that makes a lot of sense to me. Mike mentioned that they pair program everything. This reminded me how much I miss pair programming. I’ve had two serious periods of pairing in the past and I’m pretty sure it’s the best approach for a lot of software development work. The first time we didn’t call it pair programming because it was just my 12 year old self and my friend hacking away on a Commodore Vic 20 writing games in BASIC, PEEKing and POKEing the screen to make games that rivaled Pac Man. Almost. But it was great. The other time was much more recent. It’s how I learned Java courtesy of a colleague pairing extensively with me. It’s also how the first release of one third of our product suite got built incredibly quickly, by just me and that other guy. If I’m going to be programming in the future I hope it’s pair programming. Mike also mentioned how their “teams” were small, and unless their clients insisted there were no independent QA or tester roles and no PMs. They (the pairs of developers) did this stuff themselves. Thinking back again, the best software I’ve ever written was when I was completely immersed with clients and talking to them directly and I had to make sure it worked as it should. No middle man (or woman) interpreting customer needs and nobody else to leave finding bugs to, and since I don’t like my things to fail I sure as heck tested the heck out of my work. All in all, I wish I knew a lot more about Ruby and Rails because they sound like a totally cool place to work. I’m not sure if Mike’s talk was meant to be a stealth recruitment exercise, but it could certainly work as one. 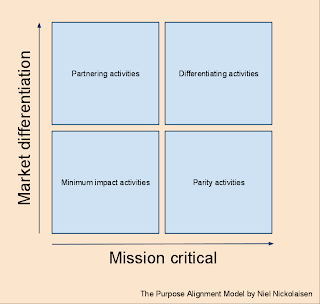 Of particular interest here is the notion that those things which fall into the top right quadrant are the ones you want to put your best effort into – you want to get the best people working on this and you want to really pay attention to the design of this stuff. By contrast, those items that fall into the lower left quadrant do not merit that kind of effort. If I understood Paul correctly, he was advocating the use of the above to think through just how much effort you put into the design of various components of a system. That seems like a good idea. But what also struck about this from an agile and scrum perspective was how such a simple thing could be used to facilitate feature prioritization in product development. Now I’ve seen before the idea of having the stories (or themes or features or what have you) up on post its on a white board, and allowing people to move them around placing those the see as highest priority at one end and lowest priority at the other. But this would overlay a slightly more rigorous evaluation of things. If, when using the open whiteboard technique, someone places an item over on the high priority side I am not immediately sure why. 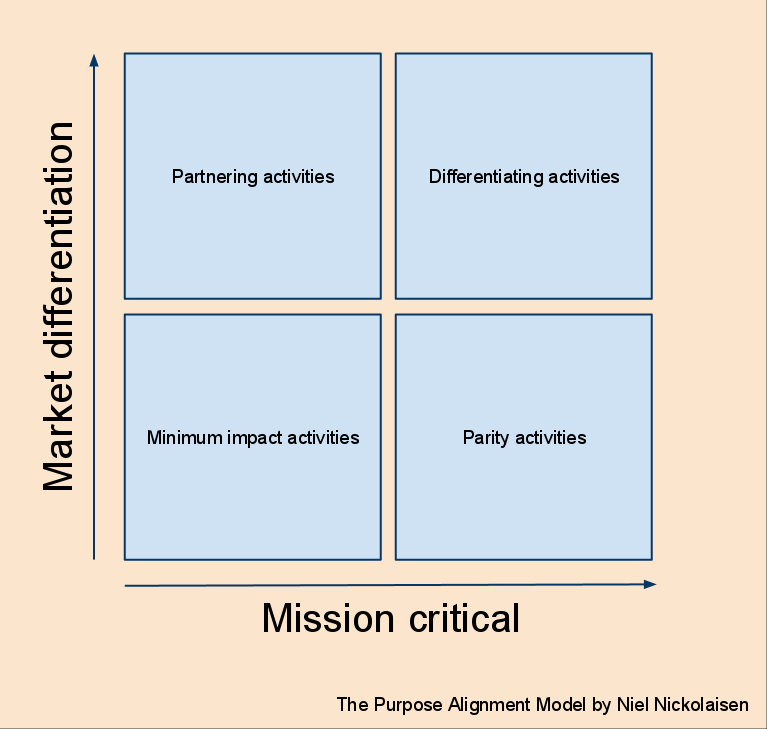 If the whiteboard was divided into four quadrants like the above I would immediately see if they thought it was mission critical, a market differentiator or both. I think that could be powerful. The second thing I got out of this session (actually a little afterwards, after Paul had blogged on the topic) was that the popular idea of “emergent design” is great if you can do it well. But how many teams really have the design and refactoring skills to pull this off? How many can spot good and bad directions to emerge to. Having a framework to first identify what components of a system merit more well-crafted design than others along with a set of good design skills to apply would indeed help I think. And that’s it. The trip home was quicker than I thought it would be too. Was very ready for the highway to have turned into parking lot but things zipped along nicely. Published at DZone with permission of Jon Archer , DZone MVB. See the original article here.